Most winners of competitions opt to use their prize money to travel overseas, but not Siviwe Bangani. His winning will go towards establishing school libraries. 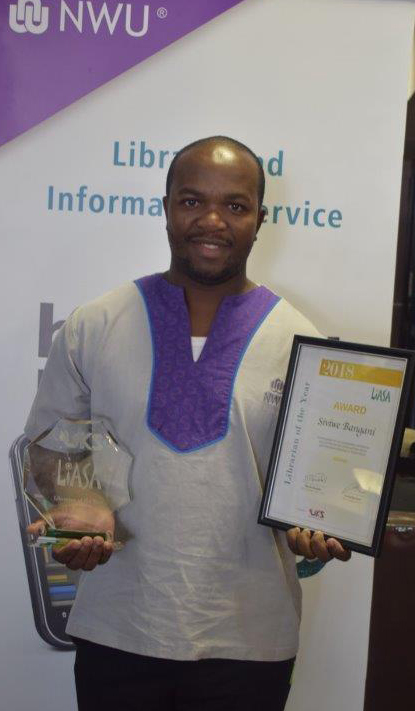 The Library and Information Association of South Africa recently announced Siviwe as national Librarian of the Year. During this annual competition, each province nominates a candidate based on various criteria. These include being an inspiration to colleagues, acting as a good ambassador, high performance over the years and going the extra mile. Once the provincial candidates have been selected, they go on to compete nationally. The national winner receives R30 000 that may be used for any educational purpose (either visits to relevant institutions locally or internationally, attending relevant conferences or further studies). Siviwe is a manager at the library on the North-West University’s campus in Mahikeng and his passion for his work shines through in everything he does. His love for community engagement projects, particularly the establishment of school libraries, leaves little doubt where he will spend his prize money.“I would like to contribute to the community by buying books for school libraries in rural areas,” he says. According to Siviwe, a 2011 study found that only about 7% of schools had functional libraries and that the situation in rural areas was dire. It is for this reason that Siviwe is passionate about turning school reading rooms into fully-fledged libraries with the help of donations from individuals and companies. Siviwe and colleagues from NWU Library and Information Services have already established reading centres at Slurry Primary School and the Magogoe Community Library, which are used by various schools. Siviwe is also an avid reader and has – for this year alone - co-authored seven peer-reviewed articles that were published in journals. “When you do your work diligently and go the extra mile, you might think people don’t notice. They do. The recognition may take some time, but it will eventually come,” he says. Siviwe Bangani is a manager at the library on the NWU’s campus in Mahikeng. Here he is with his Librarian of the Year certificate.